The Museum of Contemporary Art’s (MOCA) best-in-class energy project more than halved energy use at the facility. MOCA’s project was prompted by an Energy Assessment conducted by ABM, which recommended as Engine Control Modules (ECMs) air handler and controls renovations. The original scope of work called for the rental of temporary chillers, air handlers and humidifiers, along with piping, to be located on a flat-bed on lower Grand Avenue just outside the museum. This would provide heating, cooling and humidification to each gallery while its air handling unit (AHU) was ‘down’ for refurbishment. The cost of this rental was $128,000.00. The design engineer and ACCO thought there might be an overcapacity in the AHU’s, due to skylights being boarded over, changing of lamps to LED’s (75w-17w), and general oversizing of the equipment in the original design. Together, we devised a plan to share the load of a single AHU across two galleries. Tests were conducted to determine how long the Galleries could maintain temperature and humidity. The tests showed that the galleries could maintain design conditions for up to 6 hours without AC. Flexible ductwork was connected from one air handler to serve two separate galleries while repairs and upgrades were performed on second air handler. This process continued until all (10) air handlers were cut over. For Sunbelt Controls, programming was involved and fine tuning the PID loops took some time. Once each one was tuned, the units were able to maintain the conditioned space set-points with very little deviation and effort. ALC Controls were able to utilize significantly less energy than originally predicted in the ECM and exceed saving results in just 6 months. 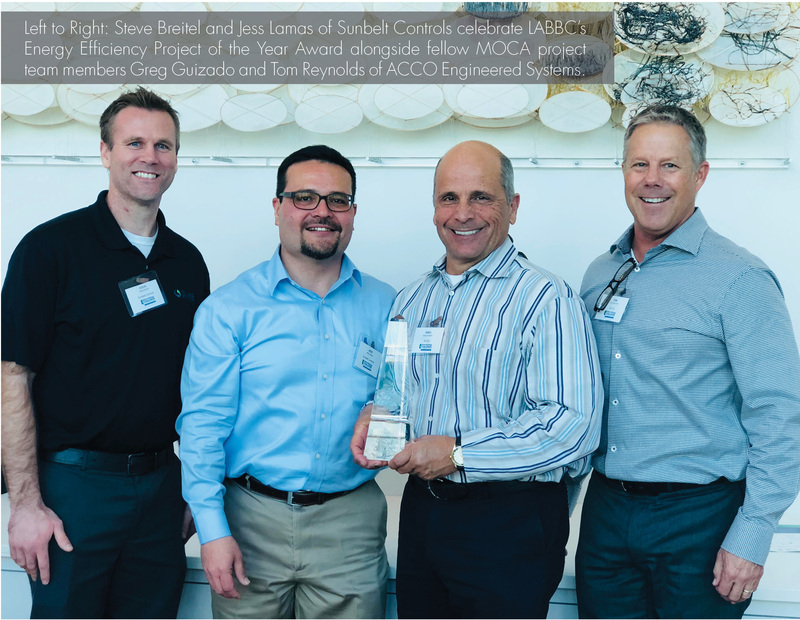 After the project was completed, MOCA won the 2018 U.S. Department of Energy’s Los Angeles Better Building Challenge (LABBC) Innovation Award for Energy Efficiency. This award recognizes a building that has achieved the greatest annual reduction in energy use or that has demonstrated the greatest continued improvement over time. 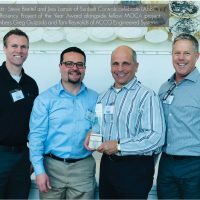 Per LABBC: “Utilizing a complex bypass and energy management control scheme, MOCA replaced all 10 air conditioning units with modern equipment, added a new Digital Energy Management System, and replaced all lighting with LED fixtures without shutting down the Museum or varying temperature or humidity by more than 1%. Six months following completion, the Museum has reduced its electrical consumption by >50%”.